New version of CodeTwo Attach Unblocker released! If you are a Microsoft Outlook user you probably know a common problem with blocked attachments that you can neither open, nor save to your hdd.. The most common files of this type are: .exe, .bat, .asp, .url, gadget., .js, .reg etc. Outlook blocks these files automatically due to the security reasons and Microsoft’s strategy aiming to protect Outlook users from virus attacks. Nevertheless, this method is not always convenient and pretty often becomes unacceptable for some people. Unblocking disabled attachments is not an easy thing to do. There are numerous questions in this matter regularly posted by irritated users on social forums and IT blogs. So to save your time spent on digging in manuals and in advanced settings of the program, CodeTwo has created a quick and friendly application that immediately brings you back a control of all attachments coming to your inbox. 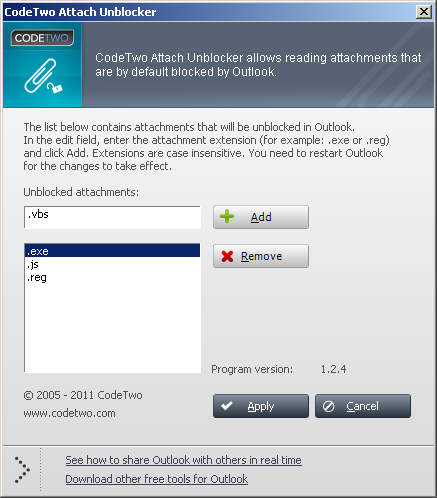 The tool is called CodeTwo Attach Unblocker and is totally free of charge. The program has been successfully serving Outlook users for the last four years. Now we are happy to show you this handy add-on once again, as it has been improved. What is new in CodeTwo Attach Unblocker 1.2.4? Apart from a completely new, ‘refreshed’ user interface, the program is now independent from Outlook and can be launched and running even when Outlook is offline. The installation file automatically checks bit version of your Microsoft Outlook and installs a proper version. We have also eliminated a problem with Windows 2000 installation error. To define the attachments types that you wish not to be blocked by Outlook anymore, you just need to create your own list by entering file extensions in a proper field (see a picture below). After restarting Outlook all attachments from your list will no longer be blocked and you will be able to open, save or forward them.